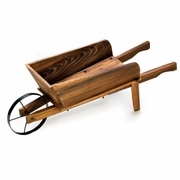 Capture the charm of a farmer�s country market with this winsome miniature flower cart. Just arrange your greenery or colorful decorative accents inside and instantly add a wagon load of blooming color to your yard. Fir wood. Plants not included. Some Assembly Required 33" x 9 3/4" x 11 1/4" high.